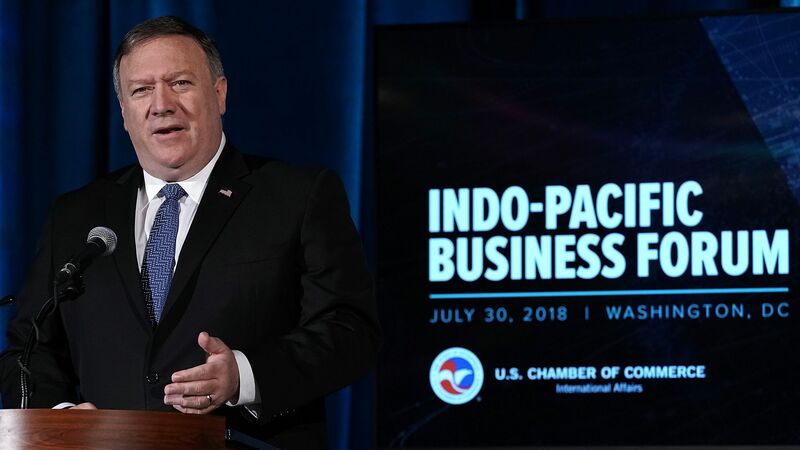 In a speech on Monday, Secretary of State Mike Pompeo rolled out the Trump administration’s long-awaited Indo-Pacific economic strategy, outlining the Trump administration’s alternative to China’s Belt and Road initiative. The big picture: The Trump administration has made the region a centerpiece of its approach to Asia, speaking frequently about the importance of a “free and open Indo-Pacific.” Pompeo highlighted the importance of deeper U.S. engagement with this large and fast-growing economic area, but the proposed strategy falls short of the scale needed to provide credible alternatives to China’s efforts, which include increasingly prominent cases of “debt-trap” diplomacy. Pompeo announced a $113 million fund to support digital, energy, and infrastructure connectivity, countering concerns about the administration’s underappreciation of diplomacy and development in U.S. foreign policy. But set against the trillion-dollar scale of the Belt and Road initiative, this new fund will struggle to compete. Additionally, Pompeo did not explain how the U.S. would leverage its diplomatic ties across the Indo-Pacific to further its stated goals. He emphasized the importance of private-sector investment, but said nothing about support, or even diplomatic endorsement, from other interested countries. Pompeo noted that further announcements on security assistance would come later this week — when he travels to Malaysia, Singapore and Indonesia — and mentioned working with the Association of Southeast Asian Nations, the Asia-Pacific Economic Cooperation Forum, and the Indian Ocean Rim Association. Washington will need to pay more attention to these institutions and their relationship with India in order to lend more diplomatic heft to this initiative across the enormous region. The bottom line: The Trump administration’s attention to development finance and diplomacy in the Indo-Pacific region is significant, but it will need to be stepped up to provide attractive alternatives for countries wooed by the easy loans of the Belt and Road.